It’s time for my final monthly accountability update for 2013. As long-term readers know, I’ve committed to posting regular accountability updates as a way of keeping myself honest and on track with my wardrobe and shopping goals. Included within these posts are what came into and left my closet during a given month, what I wore, and how I did with my shopping budget and rules. Soon I will be posting a more comprehensive report for 2013 as a whole, but today’s post covers just the month of December. I plan to continue these accountability updates during 2014 and for as long as I need them. I’ve definitely found it helpful to share the good, the bad, and the ugly truth with you as I progress along my recovering shopaholic journey. 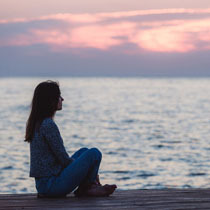 I don’t always look forward to writing these posts, especially when I’ve fallen off the wagon a bit, but what’s good for us isn’t always pleasant and can even be painful at times. I hadn’t even looked at my hat collection for a number of months and did not include hats in my January or July closet inventories. In fact, I was so unaware of this wardrobe category that I’d forgotten I had loaned a large number of hats to my friend who was being treated for breast cancer last year. It was only when she gave them back to me last month (fortunately, she’s fine now) that I realized those hats hadn’t been in my closet for over a year! I will likely pare down my hat collection further during 2014, as I intend to shift my focus this year toward minimizing my accessories now that my clothing is more under control. These items (plus 2 hats and 6 scarves) left my closet in December 2013. Bronze Clark’s sandals – I hadn’t worn these shoes for several years, but I kept them because they were comfortable and still in good shape. However, I have several alternatives that I like better (I prefer silver and pewter over gold and bronze tones), so I decided it was finally time to consign these sandals. Long grey waffle jacket – This is (hopefully) the last of my consignment buy alteration casualties. This jacket was too big when I purchased it and, like I’ve done too many times to count, I attempted to “rescue” it though excessive tailoring. The result was a bit of an ill-fitting mess, so out the jacket went. Sadly, the consignment store where it was purchased did not accept it for re-consignment, so I wasn’t able to recoup even a portion of my wasted money. At long last, I “get it” and I will no longer attempt risky alterations on my clothes! Leopard print fleece jacket – I’ve had this jacket for a few years and it was mostly intended for wearing on walks or to the gym. However, both the body and the sleeves were a tad too short. I should have either purchased a tall size or left the jacket in the store. Out it goes! Leopard print waffle top – This one stings a bit, as I just bought this top in November 2013. I liked it and the fit was good, but it was far too “fussy” to wear. I had to keep yanking and tugging at it to keep it in place and I just don’t have the patience for such clothes anymore. So I took the top for consignment after only two wears. Navy sporty Mary Janes – I bought these shoes as an alternative to my many black shoes and to wear with my more casual outfits. As I do with many of my shoes, I wore them around the house before wearing them outside to ensure that they would work for my fussy feet. The comfort just wasn’t there, so I returned the shoes to the store for a refund. Black wedge sandals – These were an impulse sale buy from the summer of 2012. I wore them a few times, but the heel is just too high for me (I was 6’2” in these shoes!). I have better options available in my closet, so these sandals are being sold on consignment. Silver tote bag – This bag was always just a bit too bright and a bit too flimsy for me. After I bought a similar but better tote in November, I decided it was time to get rid of this lesser alternative. The two hats – Both of the hats I purged from my wardrobe were in colors that I don’t really like and which don’t suit my complexion (beige and brown). I have better options, so out these ones went! The six scarves – The scarves which left my wardrobe were either too thick and bulky or too similar to other scarves I own. Since I’m becoming more comfortable with owning fewer clothes and accessories, it’s getting easier for me to let go of my less favorite items. I still have a lot of scarves, but I’ll see what I wear this year. I may end up paring this wardrobe category down further in the coming months. During December, I added 10 new items to my closet. Two of these pieces were Christmas gifts, while the others were either closet replacements or wardrobe staple items. I feel good about the things I added to my closet last month and have already worn half of them (and some several times). Although I am still buying too much, I feel that I’m making wiser purchasing decisions. That said, I will definitely be setting limits on how many items I buy during 2014 (stay tuned for my upcoming post on goals and rules for this year). 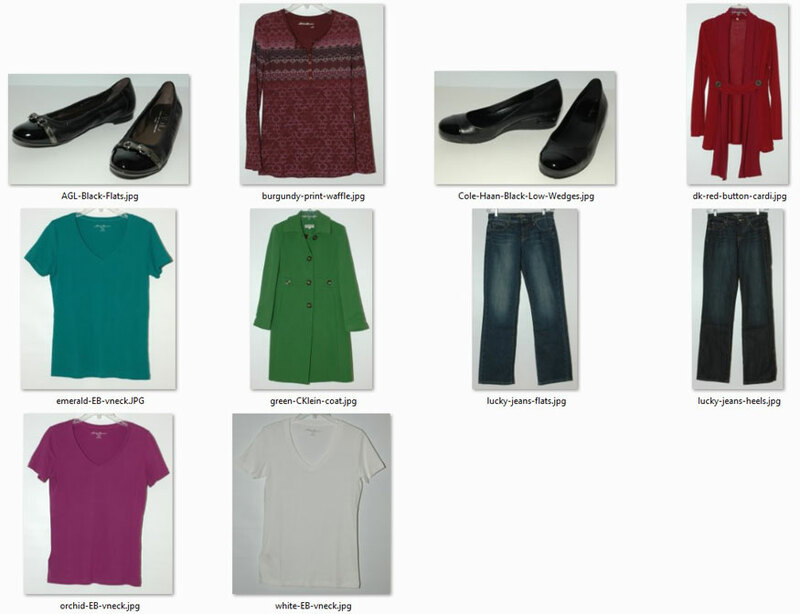 Here’s a photo (click for a larger view) of my December closet additions. These items came into my closet in December 2013. Black AGL flats – These shoes were a gift from my wonderful husband. I’ve wanted these shoes for several years now and have tried them on at Nordstrom numerous times. However, the high price tag scared me despite the fact that other women I know rave about this brand in terms of its comfort and longevity. I finally took the plunge last month when my husband bought them for me for Christmas. I know these shoes will receive a lot of wear in the coming months and years. Black low-heel wedges – These shoes were bought as a replacement for similar shoes that I wear a lot but aren’t very comfortable. The style is slightly different (the old shoes are peep-toes) but more versatile to wear during the colder months. They’re definitely more comfortable, too! Red cardigan – This was a bit of an impulse buy, as I bought it at the Reno airport after my flight home from Tahoe was delayed. However, the style is different from my other cardigans (the belt detail makes it more fitted at the waist), I love the color, and I’ve already worn it twice. I’m happy with it even though it wasn’t a planned purchase. Emerald green V-neck – This was originally going to be a workout / lounge tee, but I like the color so much that I’ve incorporated into my “regular” outfits a few times already. It’s a nice color for me, has good layering potential, and will work well with many of my printed scarves. Green coat – This was also a gift from my husband. I love brightly colored coats and they are one of my signature wardrobe pieces. This fitted silhouette works well for my shape and the color looks good on me. It’s not a heavy coat, so I know I’ll be able to wear it for at least half the year in the moderate climate where I live. Medium denim Lucky jeans – I was thrilled to finally find jeans that work for me! It’s very difficult for me to find jeans that are long enough for my legs and which aren’t overly tight on my thighs, knees, and calves (I can’t wear skinny jeans or jeggings due to a painful nerve condition). These jeans are medium-rise and straight-legged. They are fitted but not tight, are very comfortable, and are the perfect length to wear with flat shoes. Dark denim Lucky jeans – These are similar to the jeans above but are extra-long for wearing with boots and heels (I even had to have them hemmed!). I love both pairs of jeans and know they will receive lots of wear in line with my casual Southern California lifestyle. Radiant orchid V-neck – The story with this tee is similar to that of #5 above. It was originally intended for workouts and walks, but once I learned that this is the Pantone color for spring 2014, I decided to wear it for “regular” life occasions instead. While I am not overly concerned with wearing the “in” colors, I love this particular color and have worn the tee several times already. Both this and my new green tee are part of my Project 333 (more like 233) wardrobe. White V-neck – This top was purchased as a replacement for my previous white short-sleeved tee that didn’t wash well and was discarded after only 5 or 6 wears. It’s so difficult to find a white t-shirt these days that isn’t tissue thin and see-through! Although I’ve traditionally worn these Eddie Bauer V-neck tees for workouts and walks only, I’ve decided that the weight and quality of these tops will work well for my everyday wardrobe. This is the part of the post that I’ve most dreaded writing. The reason is that I have a bit of “egg on my face” in regards to my shopping budget for 2013. In a previous post, I shared how proud I was to have adhered to my budget for the first time… ever. Unfortunately, however, after the dust settled (lots of purchases and returns during December) and I did the math, it turns out that I actually exceeded my budget by $9.59 (my budget for the year was $3000 and I spent $3009.59). Yes, that isn’t very much of an overage, but I did feel a bit of a let-down, as I really wanted to be able to state without equivocation that I had come in under my budget for the year. You know what, though? I am choosing to be proud of myself anyway for how well I did with my shopping in 2013 in contrast to previous years. I made a vast improvement in the amount I spent on clothing last year and in how well I did with my purchasing decisions (believe it or not, I used to make far more mistakes!). I am fully aware of how far I still have to go before I’m truly a recovered shopaholic, but when I consider the fact that I exceeded my budget by over $2000 (!) in 2012, I can see I’ve come a long way in one short year. Of course, budget adherence is only one measure of my improvement. I will be sharing many more statistics, facts, and insights in my (two, I think) remaining 2013 wrap-up posts. When all was said and done, I spent $350.33 on clothing, shoes, accessories, and alterations during December 2013. I had some money left over from previous months, so that’s why I spent more than my $250 monthly budget during December. Of course, I shouldn’t have cut things so close and risked going over my budget! Although I’m sure I will address this topic in a future post, I want to say a bit here about the whole clothing budget “elephant in the room” before I move on. For some reason, I feel the need to spend every penny of my clothing budget, if not more. I’ve been this way for as long as I can remember and I am not like this in any other area of my life. I routinely come in far under my cash spending budget, as one example. At the end of the year, if I see that I didn’t spend all of my cash allotment, I don’t head to the bank and withdraw the balance while the getting is still good. I just let it be as it is and feel at peace with the whole thing. Not so with my clothing budget! Only recently have I begun to see the folly in my attitudes and behaviors related to my shopping budget. For some strange reason, I feel somehow “cheated” if I don’t spend all of the money I feel I have coming to me. When I stop for a moment to consider this attitude, I feel a bit like a spoiled brat child. Except I’m not a child; I’m a grown middle-aged woman who should know – and do – better! I will delve into this deeper at some point, but just wanted to call myself out a bit here. I understand that things need to change and that only I can change them. So while I fully acknowledge the positive changes I made during 2013, I vow to do even better this year in many respects. I continue to track all of the garments and shoes I’m wearing each month. During December, I wore 46 garments (including outerwear but not including workout and lounge wear) and 9 pairs of shoes. Interestingly, these totals are very similar to my November numbers (45 garments and 7 pairs of shoes). I also wore a number of items multiple times during December. My biggest “all-stars” were the bag and boots that I had dyed from brown to black during September. I carried the bag for the entire month and I wore the boots 10 times! Dyeing these items was one of the best decisions I made last year and the money spent was well worth it. Below is a photo of everything that I wore three or more times during December, 11 items in all (click for a larger view). These are the items I wore most often during 2013. Yes, there’s a lot of black in there, but I do enjoy wearing black. I also really like grey and various jewel tones, which are also represented among my December “all-stars.” Of course, there were a lot of other items that got worn last month and many of those were not black! I will always enjoy wearing black, but I’ve been working to incorporate more color and other neutrals into my wardrobe during recent years. I’m happy to be making better use of many of my closet items as time goes by and as I continue to pare down my wardrobe. Although I arguably still have too many clothes, I’m happy to be making steps in the right direction! These accountability posts are always lengthy, so I thank those of you who are still following along! 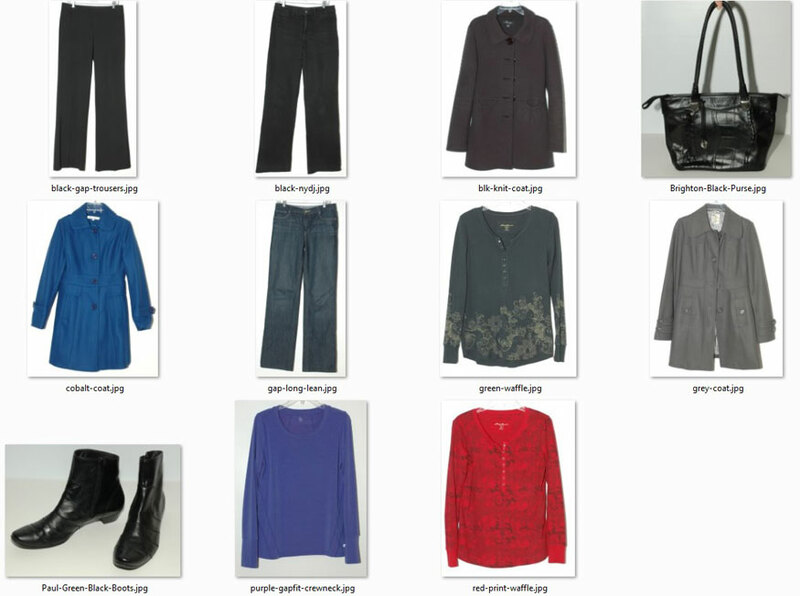 When I first started doing these posts, I wondered if anyone would really be interested in the granular details of my wardrobe journey. I knew that I liked reading such posts from other bloggers and I also knew it would be helpful for me to be accountable to my readers each month, so that’s why I proceeded. What has been pleasantly surprising to me is the number of views and comments my accountability posts receive. Because these posts help me and seem to be popular with you, I will keep on keeping on with these monthly summaries during 2014 (and perhaps longer). Just a quick tip before I close out this post… I know that most of you don’t have blogs, but if you struggle with compulsive shopping, I encourage you to form an accountability relationship with a friend, relative, or therapist. I firmly believe that being accountable to all of you each month has played a large role in the strides toward recovery that I have made thus far. Onward and upward in 2014! Thanks to those of you who have taken a few minutes to complete the compulsive shopping research questionnaire I linked to in my last post. The researcher, Dagmar Verheij, would love to get some more responses before the survey closes on Tuesday. So you if you have some time to help her out, she would greatly appreciate it. 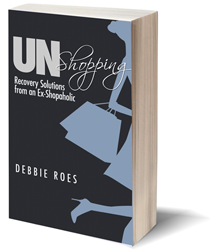 As I mentioned on Monday, at the close of her research, she will do a guest post on “Recovering Shopaholic” to report her findings. There is also still time to join the New Year Style Challenge from the 40 Plus Style blog, either officially or unofficially. A blogger I follow has taken on this challenge and is reporting her progress each day. This blogger, Sue, is a longtime follower of Project 333 and has learned a lot about her personal style through doing that challenge. However, she seems to also be learning a great deal through her participation in the 40 Plus Style challenge. I recommend this challenge to those of you who are struggling to define your personal style (although it may also be fun for those who have a good handle on their style aesthetic). You don’t have to share your findings or photos with anyone if you don’t want to. Just do the challenge for you and see where it takes you! Speaking of Project 333, you can still join in for the current term if this challenge speaks to you in any way. Check out the rules for getting started or purchase the “Dress with Less” microcourse for guidance along the way. I read your post with much interest. My goal for this year is not to spend any money on clothes. We shall see how it will go. My original no shopping plan started in September, but I bought one item in December. I told myself it’s a birthday/Christmas gift, but that is neither here nor there, right? Those ballet flats are very pretty. I am a firm believer in spending some money on shoes. They will wear better in the long run and are much kinder to your feet. No underwear or athletic wear, either? Re: shoes, it took me a while to come around, but I’ve been spending more money on footwear for a number of years now. My fussy feat just don’t do well with most lower-end shoes. I’m gradually worked toward buying quality in ALL areas of my wardrobe. Shoes, bags, and watches were my first steps, but now I’m buying better in other areas, too! A friend of a friend did just that – no clothes buying for a whole year and kept a blog about it. Thanks for sharing this link, Gillie. I love reading about such challenges and accomplishments. 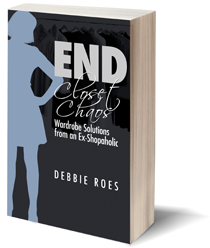 I don’t think there is a one-size-fits-all solution for everyone who struggles with overshopping and having too many clothes, but I enjoy reading about what works for various people. Congrats to your friend! I love detailed number posts! 🙂 I do the exact same thing with the budget, using up every last penny. That’s why I’ve been gradually trying to switch my mentality over to number of items purchased, and away from dollar limits. I came in within a dollar or two of $1200 last year and 33 items. Better than the 57 items and $1750+ from 2012. Best of luck to us both in having a successful, moderate 2014 shopping year! If you like detailed number posts, Mo, you’ll love the upcoming 2013 recap posts! 🙂 Congrats on the great improvements you made on shopping last year! Not only did you stick to your budget but you added fewer pieces to your wardrobe. I like your goal for 2014. I’m also going to focus more on number of items instead of just how much I spend. I don’t know if I’m ready (or if my husband is – LOL) to do away with the budget altogether, but only focusing on dollar amounts has often led me to buy too much and make some bad choices. I wish you the best of luck with your plan for this year! That was a really interesting post. It’s given me the impetus to track what I wear and buy too. I’m 10 days behind on what I wear but I’ve not bought anything yet and hoping to keep it that way for as long as possible! I’m glad you’re planning to track what you wear and buy this year, Gillie. I think you’ll learn some useful information that will help you get a better handle on your wardrobe. I still have a long way to go, but tracking has helped me make a lot of strides so far. Best wishes to you! THX that’s a great anrswe! 2012 – way over budget; 2013 by and large, on budget – 2014, under budget??? I’m wondering whether you might consider not having a budget for clothes shopping at all. I experimented with having a budget in 2012 and early 2013 and I was also compelled to use every cent of it (often exceeding the limit). What turned the tables for me was that starting last summer, I gave myself a total monthly budget (food, household, children’s items, my clothes and shoes and beauty items, books, trips, restaurant meals). If I overspend on one area of my life, I have to cut back on others. I went over budget a few times (this was more likely in the months I didn’t do daily expense tracking with Toshl), but generally it made me think harder whether one dress is worth ten movies or several restaurant meals or a lovely weekend trip. Very interesting perspective and alternative approach, FrugalFashionista! Awhile back, I did something similar and had a separate bank account for my various expenses. At the time, it wasn’t the best option for me, as I was SUCH a raging shopaholic that I would do without in other areas in order to shop. Now that I’m a recovering shopaholic, I might far much better. I am going to consider this possibility and discuss with my husband. It sounds like it’s working beautifully for you! Great post, Debbie! I’m looking forward to your 2013 summary. I’ve tracked my Monday through Friday clothing for years, but you inspired me to start tracking shoes and accessories, as well as weekend wear. I cut my “benchwarmers” — love your term — significantly in 2013. And I agree that examining seldom-worn purchases is key to avoiding future mistakes. I’m so happy to have inspired you, Tricia! Congrats on doing the tracking and the resulting decrease in wardrobe benchwarmers. I will be posting my 2013 summary soon – lots of data to compile and it’s quite time-consuming! Here’s a recommendation on tees since you mentioned you like Eddie Bauer. I used to prefer EB– until I discovered Lands End tees. They are better made and the fabric holds up longer. I found my EB tees had a tendency to sag out a bit. Thanks so much for the recommendation, Deby! I will definitely check out the Lands End tees, as the Eddie Bauer quality and longevity is not what it used to be. They used to last for years, but lately I’ve found that I need to replace them more often. I’m glad to know there’s a good alternative out there! Good for you for doing the inventory, Gillie! I know it can seem very daunting. I didn’t do an inventory when my wardrobe was at its most crowded, but I did have an image consultant come to help me do a closet audit and she was at my house for over 6 hours! I know I must have had 500+ pieces back then! Just take it one step at a time and you’ll get there. Although I’ve made good progress this year (new inventory will be posted soon), I’m still not where I want to be with my wardrobe. But I AM proud of myself for the progress I’ve made and I know I will get there. And so will you! If the $2000 you didn’t spend is still floating around your bank account–perhaps you could earmark that to a trip or something non-clothing related. You mentioned long ago that you wanted to travel more. No extra money is floating around, frugalscholar. I overspent my budget by $2000+ in 2012 and that’s a big part of why my husband and I didn’t do much travelling that year! We DO plan to travel more this year, though. We haven’t made our 2014 budget yet, but there will definitely be a chunk of money in there for travel. I’m loving how you inspire me to continue to improve, and appreciate the positive impact you’ve had on my life like no other blogger. I’m excited about the progress I am making. I was SO CLOSE to putting in an $83 order this morning but decided to wait one more week first. I have a gift card to spend and a coupon that expires the 20th. But why do I feel the compulsion to spend it constantly like it’s burning a hole in my pocket? I want to sort out these feelings and WHY I feel like this. I think that you’re right in feeling proud of what you’ve accomplished. $9.59? Not too bad. If only it was so easy to “fix” everything in a small amount of time. I know for me at least, this has been a journey of ups and downs, but the changes are starting to come and they appear to be sticking around. You’ve made many steps in the right direction and I hope that you make many more this year! You’re right, Tonya, about all of the ups and downs along the journey. I’ve found that to be the case, too, as you’ve read in my posts. But, yes, we both have made tremendous progress this past year and we definitely need to acknowledge ourselves for those strides we’ve made. Hopefully, 2014 will bring continued growth and breakthroughs for you, me, and many others! Yours is my favourite blog. Thankyou so much for all the time, effort and thoughtfulness you put into this blog. It is very helpful for me. I’m very touched by your comment, Fiona. I’m happy you’re enjoying my blog and finding it helpful! Knowing I’m benefiting others through my sharing propels me on to continue with my journey and writing about it! Yes, it’s definitely a process, Sarah! When I started 2013, I vowed to only buy one item of clothing and one accessory per month. I haven’t posted my numbers yet, but I FAR exceeded that goal! What I’ve learned is that we need to set do-able goals for ourselves and not try to be too ambitious in the beginning. We need to focus on progress, not perfection. I have a long shopping list, too, so I’m trying to narrow it down to “must haves” and “nice to haves.” A shopping list is a good thing to have, as it can help us to focus instead of just buying whatever is in front of our eyes. Try not to get discouraged and just take things one day at a time. I get discouraged, too, but if I look back a year ago and see my progress, I’m inspired to go on. Keep going and you’ll get there! Hi Debbie, thank you for continuing to write these posts. I think you did so well this year! Would you consider allowing your clothing budget to roll over year to year? Even if you ultimately opt to spend any excess elsewhere, knowing that you weren’t obligated to could help with the ‘use it or lose it’ mentality. We started a rollover budget for clothing and it has helped a lot. Thanks for your kind words, Abby, as well as your idea of carrying the budget forward. I think that could be helpful to me. Of course, I need to discuss it with my husband. Understandably, he gets worried about changing my shopping “rules,” but I can see how the suggestion you made could be helpful. As you mentioned, changing from a budget-based scenario to one where you specify a max number of items purchased might just be a great thing for you (and many of us!). At the end of last year I looked over my 2013 spreadsheet that lists (including price) each item of clothing, shoes, and accessories I bought. I went over for the year and go back and forth between feeling okay about it since the budget is super small and reminding myself that I didn’t need to buy a bunch of new or thrifted clothes, especially since I work from home. Really, do I even need to be buying things each month? Honestly, no. So for 2014, I’m changing my budget from number of dollars to number of items- I’m thinking 1-2 items a month. This should help decrease the number of items coming into my closet, help me really think about what I want and need, and give myself more leeway (and less guilt) if I want to occasionally buy an expensive, good quality item.